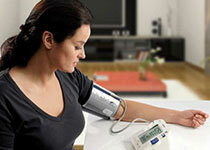 The Omron M10-IT is a fully automatic upper arm blood pressure monitor. By using the average mode it helps you detecting and keeping track of possible Morning Hypertension, being a risk factor for strokes and heart attacks. A user switch allows to change from user A to B. For both users 84 measurements with date and time can be memorized. A guest measurement is also possible. This device has the unique dual sized ComfortCuff® for comfortable and easy measurement. Of course it has Intellisense® Technology, which ensures that the right inflation pressure is automatically detected. The M10-IT also has PC connectability.